2013 was a trying time for our nation and for the Independent Living Movement. As we anticipated and adjusted to the new healthcare law, gridlock gripped Washington, eventually leading to shutdown. In the midst of overwhelming obstacles, our community fought back. We brought the UN Convention on the Rights of Persons with Disabilities back to the Senate. We took major steps toward bringing about an Independent Living Administration. And in every town and every city, advocates did the hard work, on the ground, to protect the civil rights of people with disabilities and actualize our dream: independence for all. Yet many of our brothers and sisters remain locked in nursing facilities and other institutions. The Independent Living Program remains a hostage to the whims of bureaucrats. And American culture has not yet fully embraced the Independent Living philosophy of consumer control. These are battles we can win – with your help. For that reason, I ask that you become a NCIL Member. Your direct participation in the national Independent Living Movement is critical for its success. NCIL continues to provide first class member benefits, including training and technical assistance, insurance benefits, and a world-class Annual Conference. Most importantly, NCIL provides its members with representation on Capitol Hill, ensuring that our voices are heard by those with the power to enact our priorities. I hope you will join us as we build a future of independence for all. 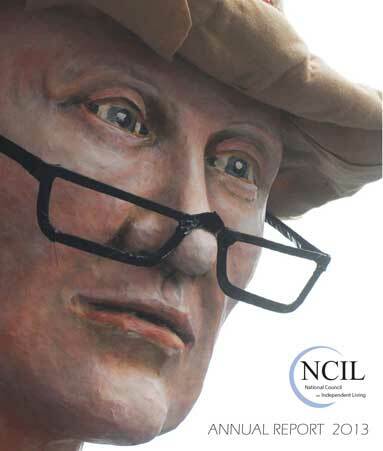 Open the NCIL 2013 Annual Report in PDF or plain text.